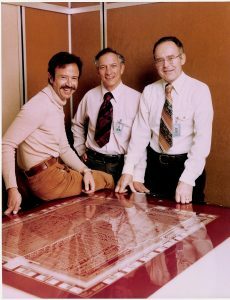 • In advance of Intel’s 50th anniversary, Gordon Moore offered an interview about the company’s early days and the personalities that built the foundation of its success. Moore, a founder of Intel with Robert Noyce, spoke of the pair’s departure from Fairchild Semiconductor; the naming of Intel; the choice of Silicon Valley — Santa Clara, California, in particular — as the company’s home; the early days with Noyce and Andy Grove; his role as Intel’s CEO, starting in 1979; and the formation of Intel’s corporate values. Leaving Fairchild Semiconductor : Fairchild was doing pretty well, but the business was slowing down. And it was being run by a headquarters based in Syosset, New York, a long ways away. 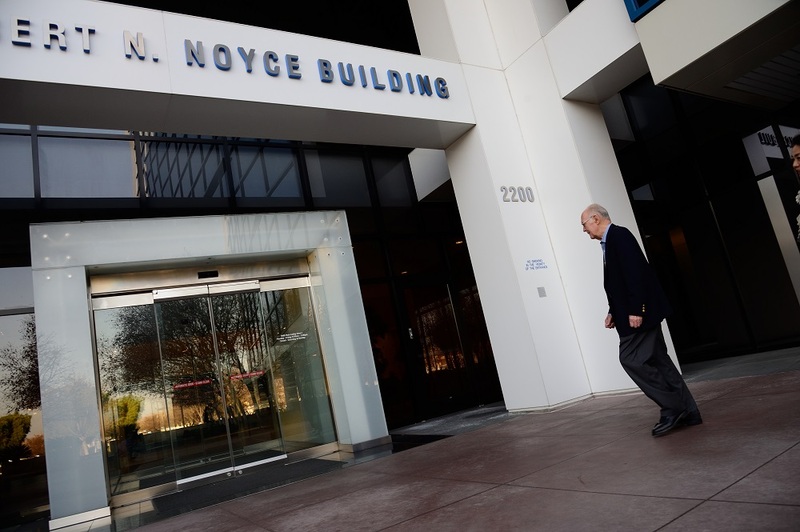 Bob [Noyce] was the logical internal candidate, and they were clearly bypassing him. So he got frustrated at that and mentioned to me one time – asked if I would like to start over again. Well, I had what I thought was the best job in the industry, the head of R&D at Fairchild, and I had no real interest in changing. But Bob came by a couple of months later and said, “I’m leaving. Are you interested?” That changed the picture quite a bit, because I knew if he left management would come in from outside and I didn’t think I’d like that very much. So I sort of [reluctantly] said, “Okay, let’s try it again.” I had mentioned to him earlier that I saw some semiconductor memory as a possible open field where you could start a new company. So he picked up on that idea, and we went off. We left Fairchild and started a company that became Intel. The first days of Intel and its founders, Gordon Moore and Robert Noyce, were covered in the Palo Alto Times of Aug. 2, 1968. Intel was started just three weeks earlier. Its first home was in a leased building in Mountain View, California. Naming Intel : We were looking for a name, we had to incorporate. So we just picked NM Electronics as a temporary name until we could find the one we really wanted, and then did a fair amount of fiddling around to come up with something we thought would be fitting. I don’t think it was one of those eureka moments that we chose that as a name. But later we found a motel company called Intelco [and] we had to buy the name from them. Choosing Santa Clara : Silicon Valley had a lot of relatively small semiconductor companies and a sprinkling of related industries like equipment manufacturers and some people using our products in a variety of electronic systems. There were still orchards. I remember when we were considering moving away as far away as Santa Clara. And it looked like we were moving out into the country. So there was a lot of space, relatively little traffic by comparison with today. It really was the valley of the heart’s delight. Bob Noyce and I had been part of the original eight to establish Fairchild. So we had worked together for a long time. Bob had a lot more knowledge of transistors than any of the rest of us at the beginning because he had worked with them at Philco. I was completely a neophyte in the semiconductor business, but I got into it. We had a long history together. Andy Grove I hired right out of grad school. It was a unique situation. I remember interviewing him thinking he looked pretty good, with a recommendation from his thesis adviser … that this is a truly outstanding individual. Whoever hires him will be very lucky. I was very lucky. And then when we were getting ready to set up Intel, I told Andy that Bob and I were going to leave and set up a new company. His immediate reaction was he wanted to come along. I had a very high opinion of Andy and was happy that he felt that way. Becoming Intel’s CEO in 1979 : That was a period of time when the microprocessor was really just starting to become established as an important product. We had a family of memories. We had a brief foray into the digital watch that didn’t that didn’t prove to be successful. As the CEO of the company, I just tried to keep people pushing in the direction that the company was already established. We hired the people that we thought were most appropriate for creating the innovations and, I hope, gave them enough space to exercise their capabilities. We had several directions working at the time, and I’m happy to see that some of them have turned out to be very important. Intel Values : The way Intel determined values, I think, was interesting and something that makes a good deal of sense. Instead of management sitting down and saying, “These are what we [value],” we took a group of people offsite for a while and said, “Okay, what do we value?” And they looked at a wide variety of things and came up with this list of five or six items. So these were things that were not forced from the top down but actually built up by people looking at what they did indeed value. I think it’s an unusual and very productive way to look for values. On 50 Years : It’s hard for me to believe that Intel is going to be 50 years old. It just doesn’t seem that long. I don’t know that there’s a particular message [for employees]. It’s a question of keep reaching and following up the things that look like they’re really good potential.